Earlier this year, indie line Kerosene launched Winter of 99, a new limited edition unisex fragrance. Late last year, the brand also launched Sacred Memory. Winter of 99 ~ "It was the end of the 90s, and Detroit was pummeled by a snow storm as panic ensued over Y2K. Were the heat and lights ever gonna come back on? Refuge under a cozy blanket with a mug in hand. It was the Winter of '99. Notes: Smoldering Vanilla, Woods, Molasses, and Nutmeg." Sacred Memory ~ "There are moments in time: relentless, firmly cemented in our thoughts. They provide comfort in their recollection: The ordinary, the monumental. Sweetness and warmth, depth and beauty. Never to fade. Notes: Red Berries, Bergamot, Whiskey Oak Barrel, Tobacco Absolute, Amber and Musk." 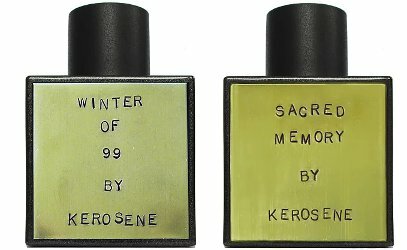 Kerosene Winter of 99 and Sacred Memory are available in 100 ml Eau de Parfum, $140 each. And the other one sounds pretty wonderful, too. I’ve never seen them in person either! I’ve smelled both of these and the notes are definitely accurate for Winter of 99. Sacred Memory was a little strange, need to smell it again and pay attention to what I’m smelling. Good to know, thanks cazaubon!